To use an EQuIS database, select File> Open Database> EQuIS Database. The EQuIS Login window opens. 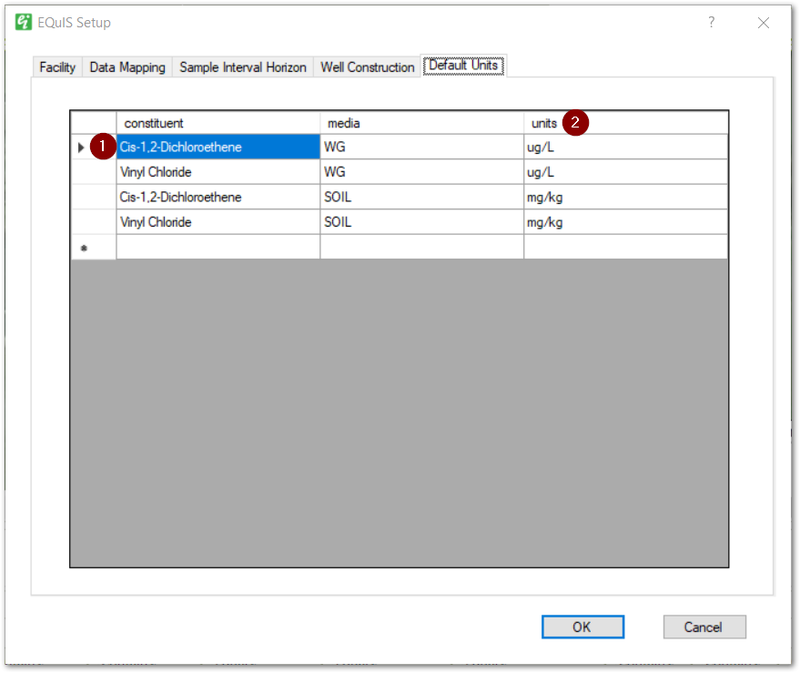 Select the desired database, EnviroInsite will consume an EnviroInsite Decision Support license while connected to an EQuIS database. After connecting to the EQuIS database, the FormEquisSetUp dialog box will open to the Facility tab. Modify EQuIS options on the Facility tab, Data Mapping tab, Sample Interval Horizon tab, Well Construction tab, and Default Units tab as desired. Select the OK button to save changes. To make changes to EQuIS options after the initial database connection, select Edit> EQuIS Options from the main menu to open the EQuIS Options (FormEquisSetup) dialog box. 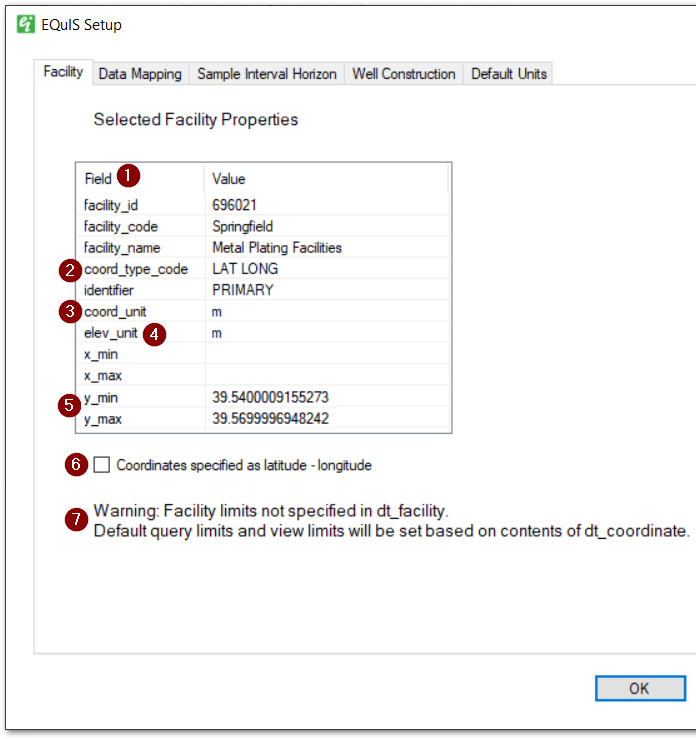 EnviroInsite reads the value of DT_FACILITY.COORD_TYPE_CODE to determine which location value should be used from DT_COORDINATES. If geographic coordinates are specified as latitude and longitude and the corresponding check box is selected on the EQuIS Options dialog box, the coordinates will automatically be converted to the selected project US State Plane, OSGB36, spherical mercator, or UTM. EnviroInsite uses the same functions for evaluation of water levels as the Water Levels report in EQuIS. See the EQuIS Professional documentation for more detailed information on Water Level reports. EnviroInsite needs the sample or depth interval for plotting data on cross-sections or in 3D. Although the DT_SAMPLE table contains sample depths, for cases where repeat samples are collected from the same interval (e.g., well screens), it may not be advisable to use those values since different users may enter them with different depths. In those cases, an alternative location for the sample intervals would be a record in the DT_WELL_SEGMENT table. 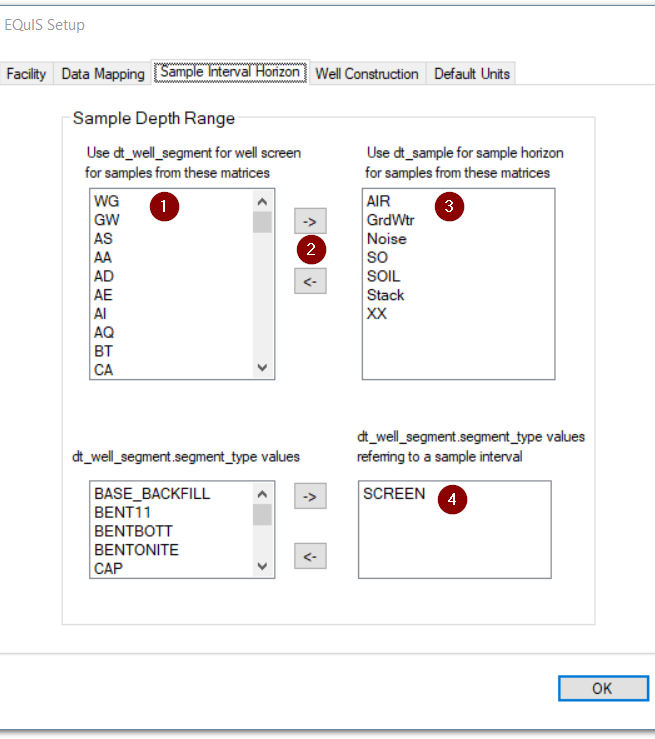 The option to use DT_WELL_SEGMENT for the sample interval is selected by the EnviroInsite user by indicating the DT_SAMPLE.MATRIX values that should be associated with an interval record in DT_WELL_SEGMENT. Not all records within DT_WELL_SEGMENT will be treated as a sample interval. The value in the DT_WELL_SEGMENT.SEGMENT_TYPE field determines whether an individual DT_WELL_SEGMENT record is considered to be representative of a sample interval. The list of values for this field, which indicate that the record contains data for a sample interval, are set by the user in the Sample Interval Horizon tab of the EQuIS Options dialog box. The IS_SCREEN_YN field of RT_WELL_SEGMENT_TYPE is used to determine the default list of SEGMENT_TYPE values considered to be a sample interval within DT_WELL_SEGMENT. Values of ‘Y’ or ‘y’ in the IS_SCREEN_YN field indicate that the associated SEGMENT_TYPE value in that record describes a sample interval or well screen. 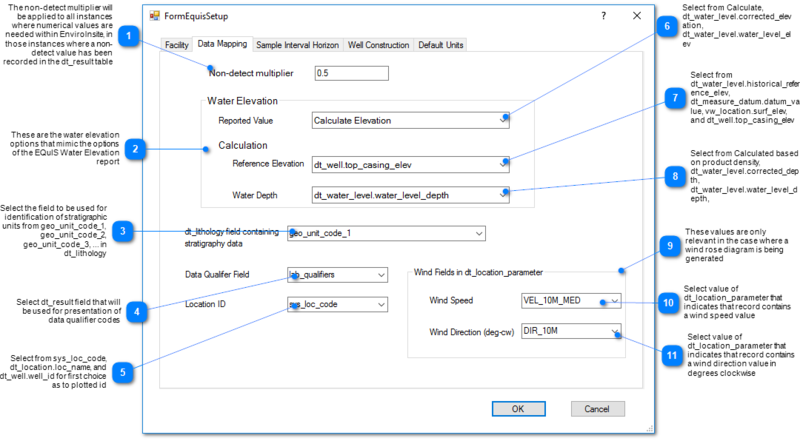 Note that EnviroInsite does not use the value of MATERIAL_TYPE_CODE in either RT_WELL_SEGMENT_TYPE or DT_WELL_SEGMENT when determining whether a SEGMENT_TYPE should be associated with a sample interval. The figure below shows the contents of the Sample Interval Horizon tab of the EQuIS Options dialog box. In this case, DT_SAMPLE.MATRIX values of “WG” will be associated with sample intervals defined in DT_WELL_SEGMENT. All other DT_SAMPLE.MATRIX values, will be associated with sample intervals defined within DT_SAMPLE. Also, DT_WELL_SEGMENT records, that contain SEGMENT_TYPE values of either “Screen” or “transducer” will be considered to be representative of well screen or sample interval horizons. The concentration units are selected from the first instance of the analyte and media matching your selection in the RT_MTH_ANL_GROUP_MEMBER table. The program will first look to REPORTING_UNITS in this table, and if not populated, will use the value in DEFAULT_UNITS. These values can be set by creating analyte groups in EQuIS. If no units are found using this approach, the program will create a query that binds DT_SAMPLE, DT_RESULT, DT_TEST, and RT_ANALYTE and selects the first instance where the chemical name and media match the values of RT_ANALYTE.CHEMICAL_NAME and DT_SAMPLE.MATRIX_CODE. If found, the program will use the value in DT_RESULT.RESULT_UNIT. You may override the default concentration units using the EQuIS options dialog box. Enter the EQuIS analyte, matrix, fraction and concentration units you want to use. If the units are different from what is stored in EQuIS laboratory results tables, make sure that the necessary unit conversion values are defined in EQuIS.